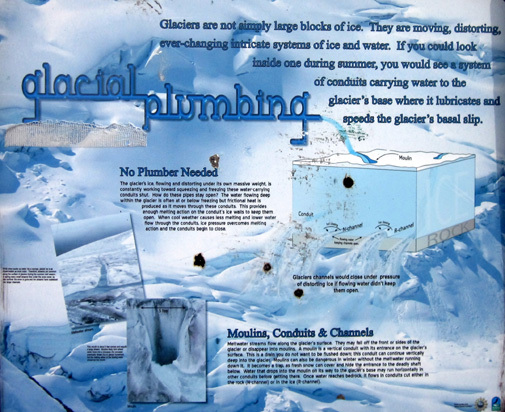 where it lubricates and speeds the glacier's basal slip." 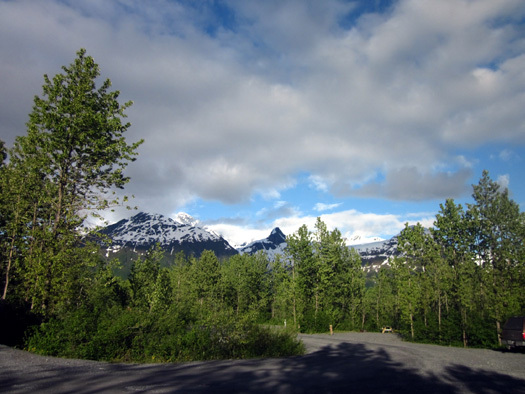 The campground where we chose to stay for three nights while we visited Valdez is located about four miles from the edge of town on Airport Road, close to Valdez Glacier. Note all the mountains, glaciers, and water surrounding Valdez. 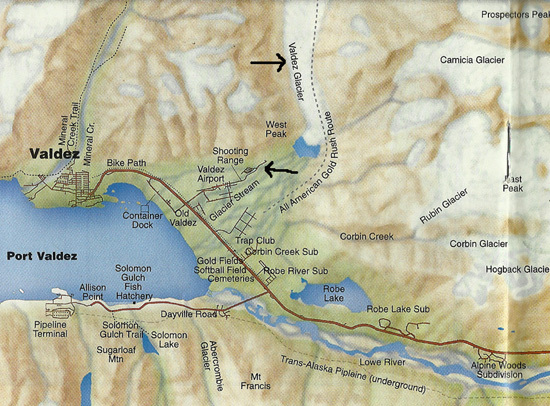 That map also shows where the original (and tortuous) All-American Gold Rush Trail began up Valdez Glacier. 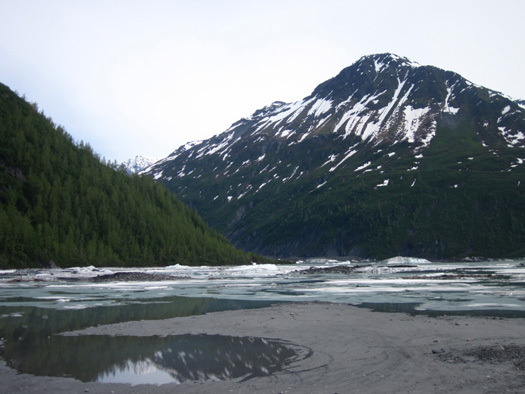 In this entry I'll describe the Valdez Glacier Campground, talk about other camping options in the area, and show photos from the lake at the base of Valdez Glacier. Since Jim is retired military and we have the opportunity to stay at FamCamps across the USA, we always research military campground options when we're traveling in our RV. 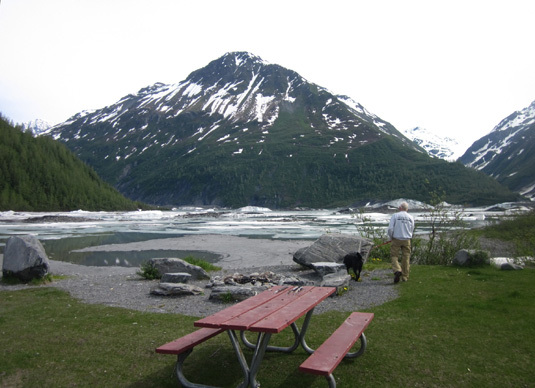 Valdez Glacier Campground is one of several military campgrounds we plan to use while we're in Alaska this summer. Although this campground is run by the U.S. Army (specifically, Fort Greeley near Delta Junction) it is open to the public. Active-duty and retired military personnel have first dibs and a slightly lower rate on sites than the general public. Military prices currently are $10/night for tent sites, $15 for RV sites with no hookups, $25 for sites with 30-amp electrical hookups, and $30 for 50 amps. We paid $25/night for two nights for our 30-amp site and $20 for a third night with a $5-off coupon we found in a Valdez promotional booklet that we picked up in Tok. The campground takes checks and cash but not credit cards. Rates for the general public are $5/night higher if sites are available. I don't know how crowded this campground gets in the summer, but this week the place was barely occupied. (In mid-June this year it's quite chilly and there is snow still piled up in some places at sea level.) We saw folks camping in fewer then a dozen sites this weekend. There aren't very many sites with electricity -- only 21 of 108 sites (the ones in bluish gray in the campground map above) -- and those were mostly occupied while we were there. About ten of these sites have permanent rental units in them with large propane tanks outside. 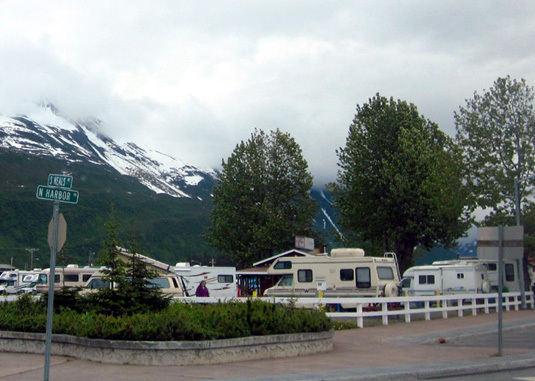 These rental RVs are used by military personnel from Fort Greeley who come down to Valdez to fish and play. But there are so many other nice wooded sites in this campground that it's hard to imagine it ever completely fills up. It's a great place to stay if you don't need hookups. There is a dump station and a large, new bathroom facility near the entrance with free hot showers and flush toilets for registered campers. There are also several nice pit toilets on the no-hookup loops for convenience. Since none of the sites have water connections we filled our tank with fresh water (next photo) before choosing a campsite. We'll use the dump station when we leave. All of the back-in sites with electricity appear large enough for big rigs. Only a few of the no-hookup sites, even the pull-thrus, can accommodate large RVs but they are perfect for small to and medium-sized units. 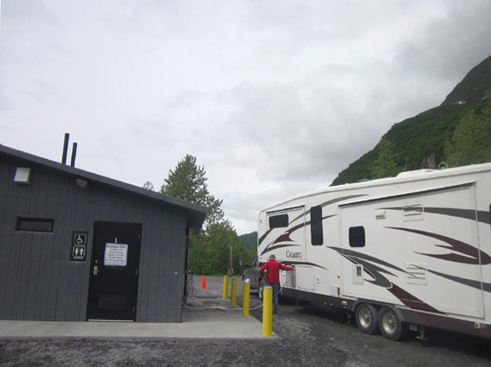 We chose one of the large back-in sites (below) with 30-amp electricity, then walked and rode our bikes through the remaining loops to see if any other no-hookup sites would be suitable for our 36-foot 5th-wheel coach on any future visits to Valdez. We found only a few no-hookup sites we could maneuver into. The gravel roads on some of the non-hookup loops are rather narrow and in some places overhanging branches and/or trees are too close to allow for enough room to maneuver our camper into a site. I love the look of this campground. Although many of the sites are small, each has lots of privacy with all the trees, shrubs, and other rainforest vegetation. 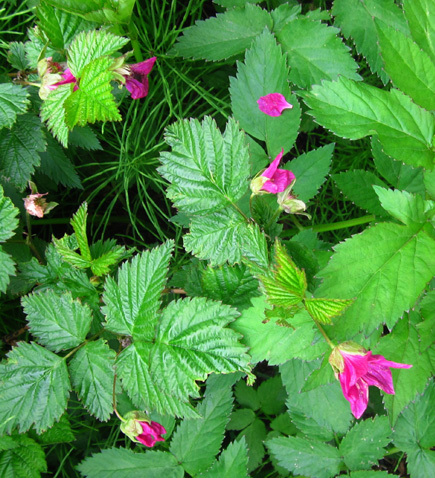 We saw lots of these pink-flowering shrubs in the campground and Valdez area. 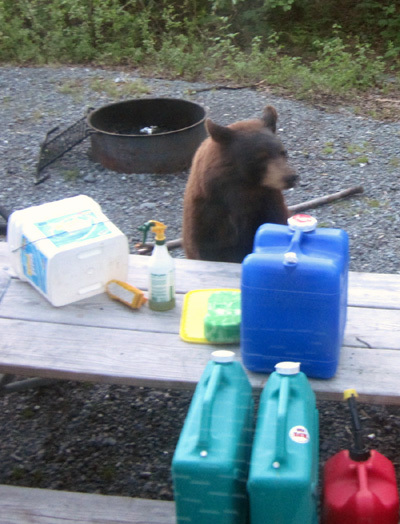 The campground is full of wildlife, too. This is one of those times when I wish I had a better camera to capture distant details. It was still that light at 10 PM. I love it! After spotting the bear I was more careful to keep Cody on his leash when he went out to pee and on walks through the campground. Today we saw two more black bears along Richardson Hwy. when we drove into town. Except for some loud airplanes landing at the little airport about a mile away, this campground is usually very quiet. We didn't hear anyone at the nearby shooting range while we were here. Those were our closest neighbors (background) and they left after our first night here. We were able to ride our bikes safely along paved Airport Rd. 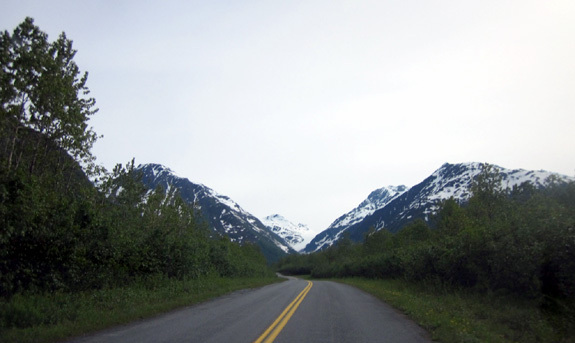 for about a mile to a connecting leg of the bike path that runs along the Richardson Highway. The connector begins near the airport. Good thing, because a surprising number of vehicles travel that part of the road. It is about three miles from the airport to town. 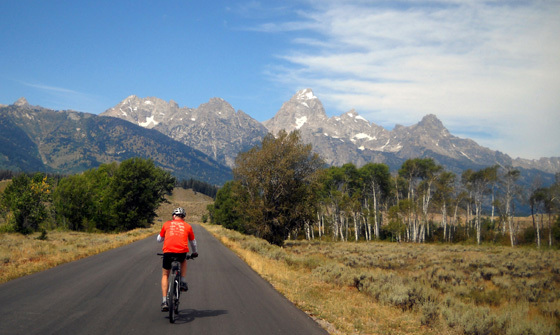 Jim did two long rides of over twenty miles from our campground and I did one. Jim also rode his bike back another mile to the end of Airport Road to Valdez Glacier Lake. Later we drove the truck out there and let Cody play in the snow (more photos from the lake later in this entry). Airport Rd. 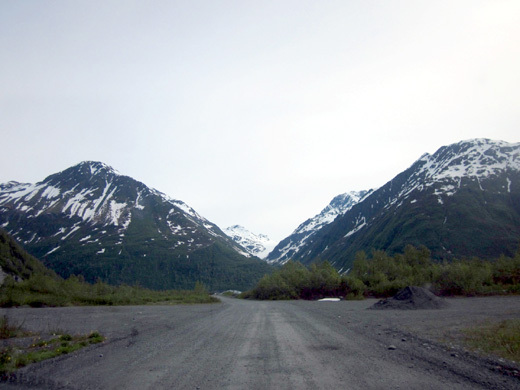 between our campground and Valdez Glacier had very little traffic. We have good Verizon cell phone and MiFi internet signals at our campsite despite having only one signal bar and extended network. Jim found decent free WiFi near the campground host's site when he wanted to watch a movie on his laptop computer. We don't have any TV reception, however (we don't have a satellite dish). That's fine with me; I don't watch TV much. 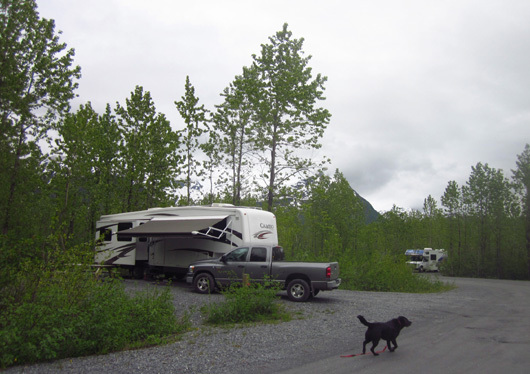 We really enjoyed staying at the Valdez Glacier Campground. 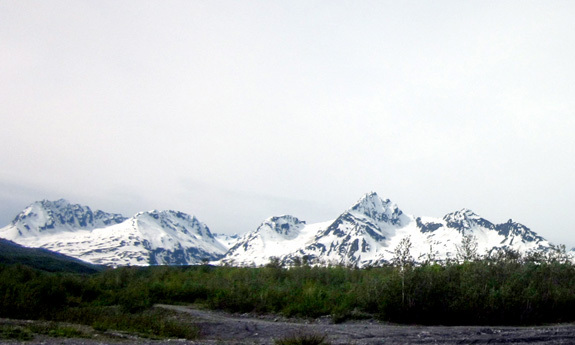 I think it is the prettiest camping option in Valdez, it has the most privacy between sites, and it is a good value for the money. However, our campground is about four miles from the downtown area, most sites don't have any hook-ups, and there aren't many sites large enough for big rigs. 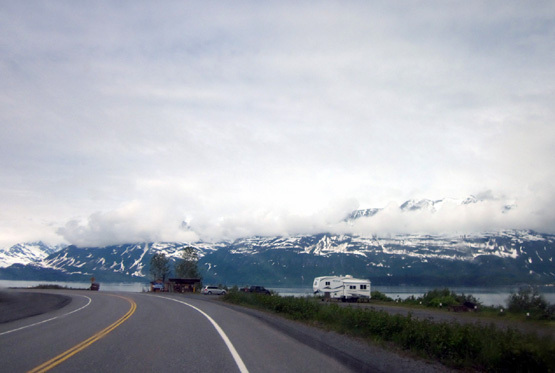 If you want more hook-ups, more room for a big rig, and/or prefer to be near the harbor area there are several private campgrounds in the downtown area that can accommodate you -- Eagle's Rest, Bayside, Bear Paw, and Chena RV Parks are listed in my Alaskan Camping book and The Milespost. 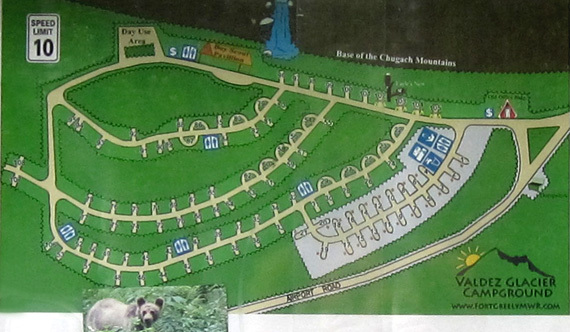 Bear Paw has both a family RV park and an adult-only park. I like that concept but I bet it's pricey. 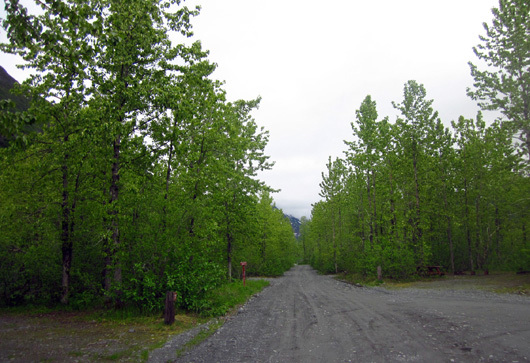 Bear Creek RV Park is located several miles out Richardson Hwy. near the old town site. It also has some cabins and access to the bike path. If you are OK boon-docking but want to be right next to the water there are 50+ sites run by the city at Allison Point on Dayville Rd. near the fish hatchery. 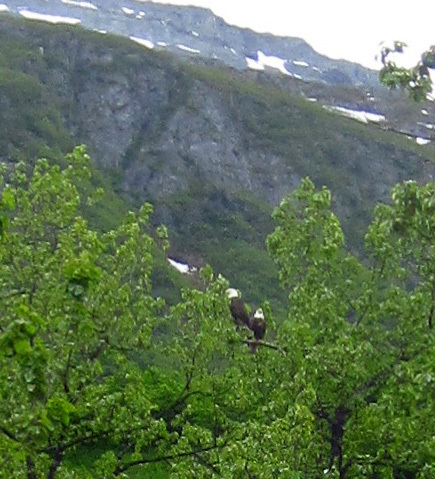 You can see the location on the map above, across the bay from Valdez. Some sites at Allison Point accommodate rigs to 45 feet in length. This campground is a very popular place to camp when the salmon are running because folks parked on the ocean side can fish right from their campsite. That's because the salmon aren't running yet! It'll probably be packed soon. 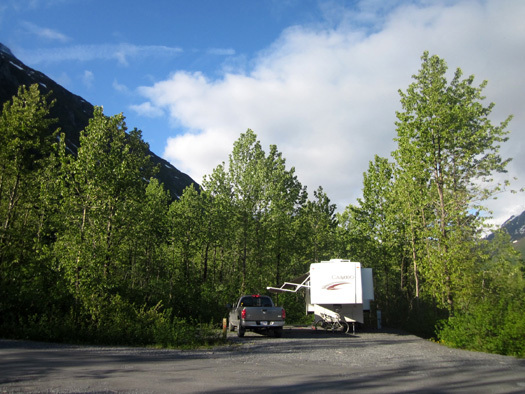 Another option for camping farther northeast of Valdez is the small Blueberry Lake State Recreation Site campground near Mile 24 of the Richardson Hwy. 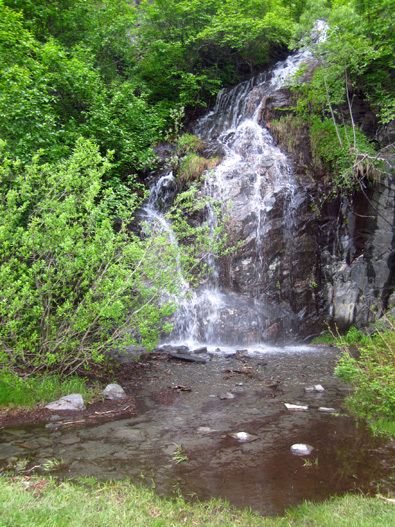 The location is spectacular because it sits just below the summit of Thompson Pass, surrounded by mountains and meadows. When we drove by it a few days ago, however, the whole campground and lake were still buried under snow! I'll talk more about that area in the next section. There may be other boon-docking places we didn't see. And no, the town is too small to have a Walmart . . . but some other towns/cities in Alaska do. All are on East Peak. 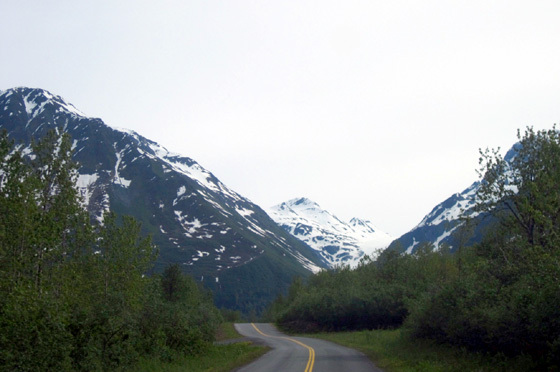 Valdez Glacier is on West Peak and not visible from the road. All the white areas on the map at the top of this entry are glaciers. There are many more nearby that are beyond that section. 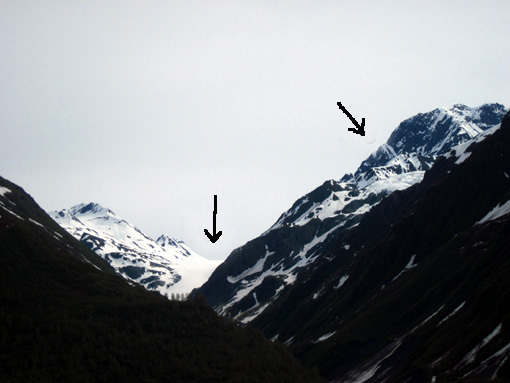 The Chugach Mountains are full of glaciers and ice fields. A group of kayakers prepares for a ride on the lake. With all the snow, mud, and ice we didn't attempt to get closer to the glacier when we went out to the lake today. 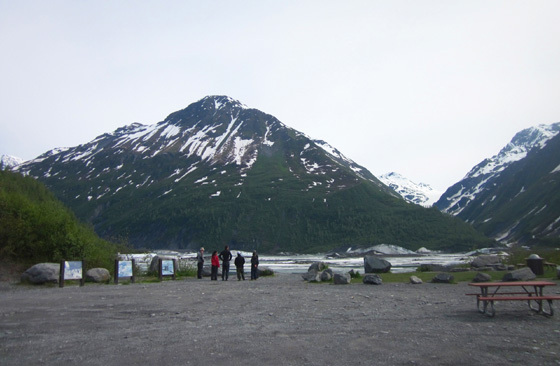 The young MWR hosts at our campground said there is a very rugged path full of boulders to the glacier but even after some of the snow melts, you have to do some rock climbing with ropes to get to a point where you can see the glacier or get onto the ice. And apparently you've got to get across the lake first. Jim and Cody walk past the picnic area. Valdez Glacier is hidden in the valley to the left. The lake is a beautiful blue color from all the glacial silt that flows down into it. There are numerous chunks of ice floating in it. 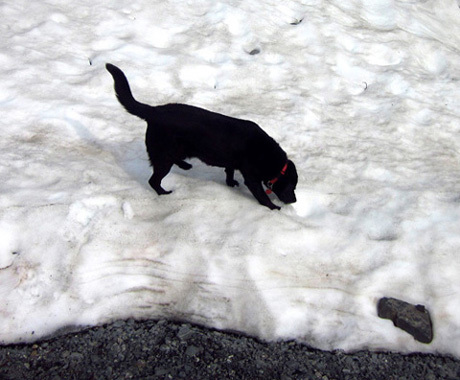 Cody had fun digging/sniffing in the snow at the lake outlet. While we were enjoying the beauty of the lake and reading the interpretive signs nearby, a group of kayakers was receiving instructions from a guide who was preparing to take them out on the lake. The last thing we heard her say was to watch where they stepped as they carried their kayaks across the mud and rocks to the icy water. We didn't stick around to watch them do their portage. The flat land on the east side of Airport Road is one huge drainage area for East and West Mountains. You can see that on the map at the top of the page. Only one truck camper was parked out there today. If the weather forecast was better for next week we'd stay in Valdez a few days longer. However, we plan to leave tomorrow morning for Anchorage. We'll make that into a two-day drive so we can see a few things along the way. 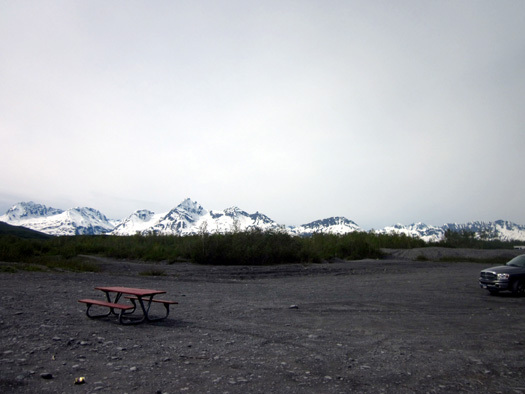 We'll consider returning to Valdez later on this summer if we have time. I'd really like to explore some more trails after the snow melts.